Two men have each been sentenced to 10 years in prison after being found guilty of deliberately setting fire to a Stoke-on-Trent mosque. 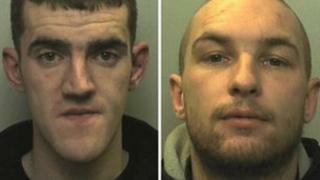 Ex-soldier Simon Beech, 23, and Garreth Foster, 29, both from Stoke, were found guilty of setting fire to Hanley's Regent Road mosque on 3 December. The pair had denied committing arson with intent to endanger life. Stoke-on-Trent Crown Court heard it was in revenge for Muslim extremists burning poppies on Armistice Day. Beech told the court during the four-day trial that he had been a member of the English Defence League and the British National Party. But he said he was not racist and did not believe his views to be extreme. Paul Spratt, prosecuting, told the jury of five men and seven women that police had been able to establish that Beech "felt very strongly about Muslims" after accessing his Facebook account. "He found persons through Facebook who had like-minded views. One observation he plainly agreed with was 'Nuke All Mosques'." The jury heard that one of Beech's online comments read: "The time has come. They burn our poppies, we burn their place. Burn the lot of them out." Beech told jurors his views were not aimed at the whole Muslim community but at extremist individuals. When giving evidence in his defence Foster told the court: "I have always personally got on well with Muslims. "Throughout all my schools I have always had Asian friends." The pair both denied running a pipe into the building from a nearby gas meter in a bid to spark an explosion at the mosque, which suffered about £50,000 damage as a result of the fire. Speaking after the verdicts were delivered, Rana Tufail, a member of the mosque committee, said it was "difficult" to describe the arson attack. He said: "It is a community project. "They have put their soul into it. They have put their earnings into it and they [Beech and Foster] tried to destroy it. "We are happy that it's still standing." Ch Supt Bernie O'Rielly, from Staffordshire Police, added that he had no doubts that the pair's intention was to "blow the mosque up". "Without doubt that would have caused hate in the community, division in the community and broken down all the cohesion and good work we do," he said. "The community around this area have been an absolute credit. They've acted with such restraint and so dignified in the face of such provocation."